ANNUAL MEETING and SPRING LUNCHEON: Wednesday, May 8, 2019. Location TBA. THE SPRINGFIELD GARDEN CLUB HOSTED CHARLIE NARDOZZI on June 6th, 2018 at the Congregational Church on Main Street. 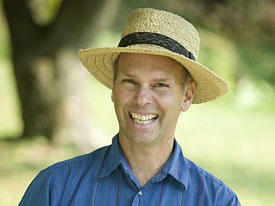 Nardozzi is a nationally recognized garden writer, radio and TV show host, consultant, and speaker. Charlie is a guest on VPR's Vermont Edition during the growing season. He also offers garden tips on local television and is a frequent guest on national programs. Charlie Nardozzi's topic was "Gardening in New England" with a focus on perennials, shrubs, vines and trees. He described many familiar as well as unfamiliar plants and their use in Vermont gardens with varying light and moisture conditions. Examples are plants best for slopes, full sun and various degrees of shade including "wet shade" and "dry shade" environments. Some in the audience were feverishly taking notes, and Charlie adeptly answered all of the many questions posed. After the presentation, he was available to autograph his book on month-by-month gardening in New England for those purchasing a copy.